Dave Kovic owns a temporary employment agency in Washington, D.C. with the slogan, "Everybody Works on Monday". Lucky enough to look exactly like President Bill Mitchell, Dave also works parties and grand openings as a celebrity impersonator. KEVIN KLINE plays both roles in this smart comedy-drama directed by Ivan Reitman. Kovic draws the attention of the Secret Service who hire him for one night to act as Mitchell while the real president is in bed with a White House secretary. Power-hungry Chief of Staff Bob Alexander (LANGELLA) can almost taste the presidency when Mitchell suffers a massive stroke in the secretary's arms. The President is rushed to the hospital in a coma and is not expected to live. Instead of turning power over to the Vice President, Bob coerces Communications Director Alan Reed into making Dave's temporary assignment more permanent. They pay off the nurses and doctors, tell the Press that it was only a minor stroke, and move Dave into the Oval office. Honest Dave, who doesn't even cheat on his taxes wonders if it's legal. Alan reassures him: "Dave, the American people will sleep better at night if they think Bill Mitchell is sitting in this chair. Wouldn't you go through a red light if there was nobody around and you had to get your sick mother to the hospital? The country is sick, and you're going to take it to the hospital." Dave doesn't know that Bob plans to implicate Vice President Nance (KINGSLEY) in a Savings & Loan scandal, force him to resign, and then get Dave as Mitchell to appoint him V.P. When the real Mitchell dies, Bob will become President. Bob and Alan don't have to worry about the first lady, Ellen (WEAVER), detecting the difference between Dave and her real husband. The Pres and first lady don't sleep together or even talk because she hates him: "Why can't you die from a stroke like everybody else?" 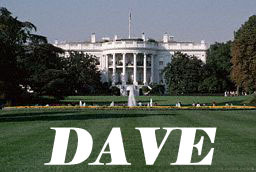 Naive Dave in the White House is like an Elvis fan at Graceland. He puts "souvenirs" like White House pens in his bag, romps with the dogs on the White House lawn, and quotes President Mitchell's speeches verbatim. The Media becomes infatuated with the new, friendlier Bill Mitchell. Here there are cameo appearances by Jay Leno, Arnold Schwartzenegger, Tip O'Neil, John McLaughlin, and several real news reporters like MacNeill and Lehrer: "He's rejuvenated. He has faced death in the eye and been transformed." Oliver Stone appears suggesting that if you look at a picture of Mitchell before and after the stroke you can see subtle differences. Still the public is fooled by the imposter, and Bob's plan runs smooth until Dave visits a homeless shelter with Ellen. Bob's not counting on Dave becoming so committed to keeping Federal funding for the shelters that he begins to usurp power. "If you can cut $650,000,000 from the Federal budget you can keep your lousy shelters." And that's exactly what Dave does. Frank Langella is deliciously evil as the power-crazy Bob Alexander. He reminds me of another Bob who once inhabited the White House whose last name was Haldeman. Kevin Dunn also gives a great performance as Bob's flunky who allies with Dave. My favorite supporting actor, though he plays a very minor supporting role, is Charles Grodin as Murray Blum, a CPA friend who Dave calls in to help cut money from the budget. Murray makes an understatement about the government that every American, with or without an Accounting background, already knows: If I ran my business this way, I'd be out of business."